Today's card is the Ten of Wands (reversed) from the Mystic Faerie Tarot deck. Tens have to do with finishing a cycle, endings and beginnings, completions and sometimes family matters. Wands indicate energy, action, projects, ideas, opportunities and responsibilities. 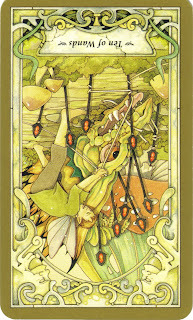 The Ten of Wands, in its upright position, shows an image of being weighted down by all ten wands. There is a sense of feeling overwhelmed or burdened with projects and activities. Have you taken on too much? Today the Ten of Wands is reversed, which means that if you have been feeling stressed or pressured with your responsibilities or deadlines, you will find some relief...as though your load is getting lighter for some reason. Either you have delegated or deleted some of the things that were on your plate, OR your perspective has changed, possibly by changing your thoughts and beliefs about the situation and the role you play. The reversed Ten of Wands may also indicate that you have been preparing for some changes in your life, possibly subconsciously, and are getting ready to more fully commit to your new direction. This card indicates that you are getting rid of the things that have been weighing you down and are starting to feel some relief...as though you've been holding your breath and have just opened your mouth to allow the cool air to rush into your oxygen-starved lungs. Feel the relief of these decisions in your life and/or grateful for situations changing to help relieve some of the pressure. Be grateful for this reprieve because the Ten also symbolizes the end of a cycle, which means it's time to start again with the Ace of Wands (start of a new venture). The Ten of Wands (reversed) is the ideal energy in which to start off this New Year. Release the burdens of last year and begin with a clean slate. You are the artist. You select the medium and the colors, textures, sizes and shapes. This is your new masterpiece. Happy New Year! I feel like the ending is still happening, continuing to make way for the new and clarity and focus are returning bit by bit with each opening. This really resonates with me as I just finished a huge project (a real labor of love). Definitely right on! What a relief, eh? I just posted about some possible upheaval in my professional life, so this feels very pertinent. My position MAY be eliminated in June. I may need to start applying for other jobs within my agency if none of my co-workers transition out of their positions. The position I would likely apply for may be a good fit, however. So much is up in the air right now. Also, I feel like things with my divorce and debts are coming to a close or at least getting settled. I am taking care of the last two things that hold me to my ex, and am starting to feel more energy for other endeavors. I want to echo Kim and say that it always feels like you pull these cards just for me, too. WhoooHoooo! A New Year! 2009 is gone, thankfully this cycle (reversed 10 of wands) has ended. After more than a year of unemployment, moving in with friends, then relatives, finishing my masters degree, hopeful interviews, promises broken and a whole helluvalot of angst and straight up heartbreak the dark night of the soul has ended! Yesterday the stars all aligned and I was offered a new career opportunity that I am absolutely thrilled about! I begin training Jan 25th after the affects of mercury retrograde are clearly gone! Yahooooo! Hmmmm...I'm reading this after an overwhelming day. Guess the message is that I need to reprioritize so that I can get to the parts that are important. I love this: "You are the artist. You select the medium and the colors, textures, sizes and shapes." I'm digging the vibe of this card. I've felt emotionally overwhelmed lately, but I'm ready to move on. And to declutter my house!